I hope you enjoy this image. I think it is fun and casual. So here is a "pocket full of posies" and an early happy mother's day greeting to all mothers. CTO has a great challenge if you want to get a jump on those mother's day cards. I used a combination of things in order to create this card. Most importantly the image I used is from our wonderful sponsor at Digi Doodle Shop. Thank you so much Digi Doodle Shop for being our sponsor. I must admit that I fell in love with this image the moment I saw it. So stop on over and take a peek at the Digi Doodle Shop you will not be disappointed. They have some great images. Don't forget to join in on the fun and get those mother's day cards in the mail. 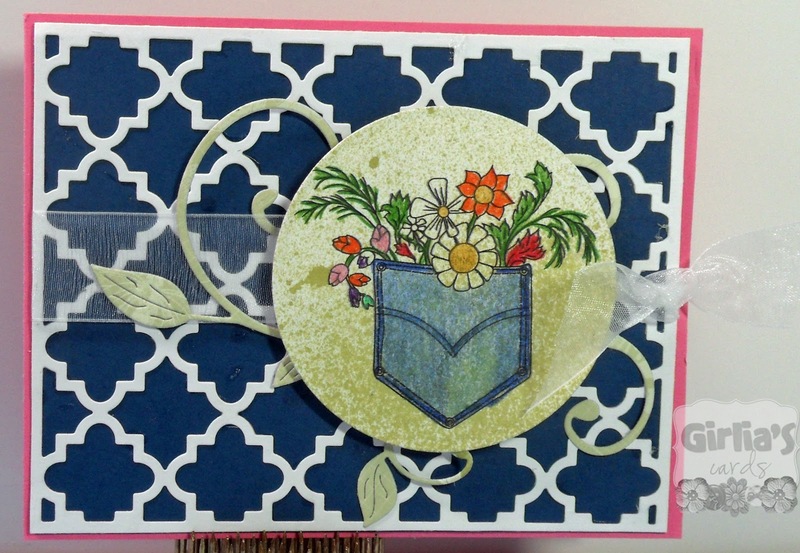 Lovely card, your coloring is perfect, love your background die cut too! Pretty. Especially like the sheer ribbon. Hi, Gloria!!! I love your pocket full of posies card! It's so pretty! I love this card!!! The pocket with flowers is so cute! Thanks for the link to check it out! so charming love that pocket. That is such a cute image and I love the background paper! Have a wonderful Mother's Day! Very lovely.love the background with poping pocket. Beautiful job! What a beautiful card!